Quick, easy, and full of flavor, this Thai-inspired Honey Sriracha Lime Dressing is sure to be your new favorite salad topper! Though your salad may not flip in the literal sense, you’re sure to over this deliciously tasty dressing. 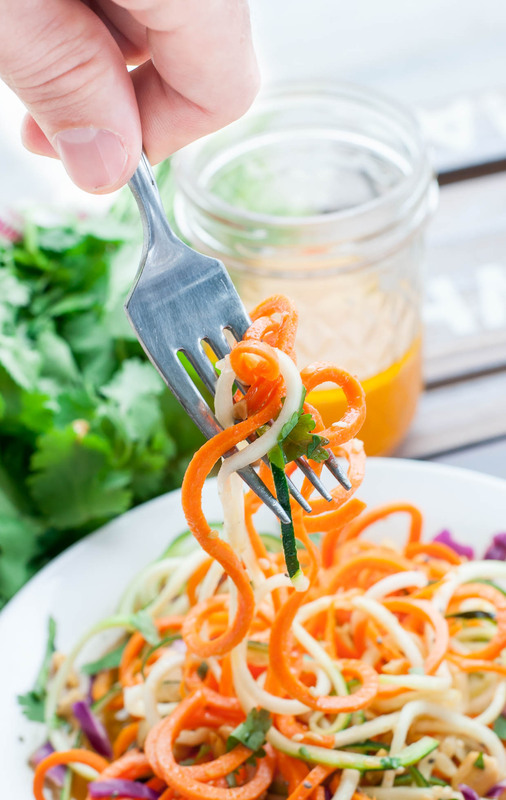 The ingredient combo was inspired by my head over heels obsession with the sweet and sour dressing from my Sweet and Sour Thai Carrot and Cucumber Noodle Salad and the desire to spice things up a little! In an effort to prevent excessive face-fanning from Sriracha-overload [does such a thing exist?] I limited myself to one manageable teaspoon. I think that’s the perfect starting point! The zing factor increases with each extra teaspoon added after the fist and I fully expect a few of you to go nuts with it! Add a little, or a lot! Taste as you go, and either way, you’re going to love this sassy salad dressing! Ready to sass up you salad? Roll your lime on the countertop to help release the juices, then slice and squeeze into a small bowl. Measure out 3 TBSP and set aside. 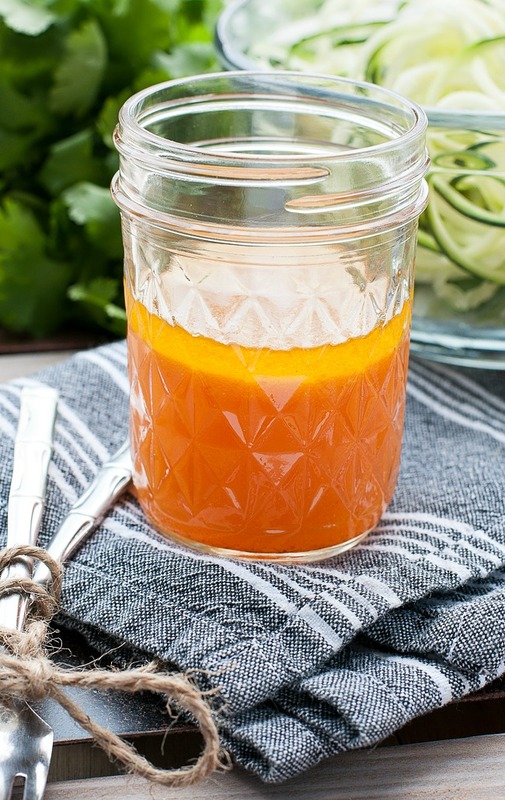 Combine citrus juice with vinegar, oil, honey, sugar, garlic, Sriracha, and salt and whisk to incorporate. Enjoy! If using lemons instead of lime, one extra large lemon should yield enough juice. When using limes, count on having two handy just in case, since they're usually smaller and yield less juice. As mentioned above, lemon juice is a delicious substitution if you don't have a lime handy; I've made this dressing both ways and it's simply glorious! You may also swap rice vinegar for the white wine vinegar if you prefer. Though I used olive oil in my dressing, feel free to try it with avocado oil or grape seed oil for an equally healthy swap! so. . . how was it!? Glorious! I’m super in love with this dressing! Paired with cucumbers of any sort, it’s truly a thing of beauty. Refreshing, crisp cucumbers are a perfect match for this dressing. Serve it on a simple sliced cucumber salad with a little chopped cilantro or dill, or simply empty the contents of your crisper drawer into a bowl and have at it! 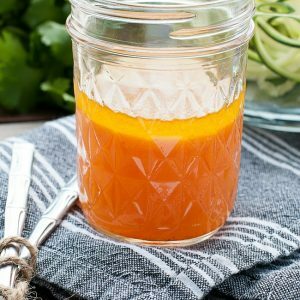 Since the vinaigrette channels a medley of sweet, sour, and spicy flavors, it will compliment grilled chicken dishes, tofu, fish [ohmygosh salmon! yes!] and even shrimp, so feel free to top your salad with a little protein or serve it up on the side. You could even go super duper Sriracha crazy and serve it alongside my Sriracha Seared Scallops or Sriracha Almond Crusted Salmon! 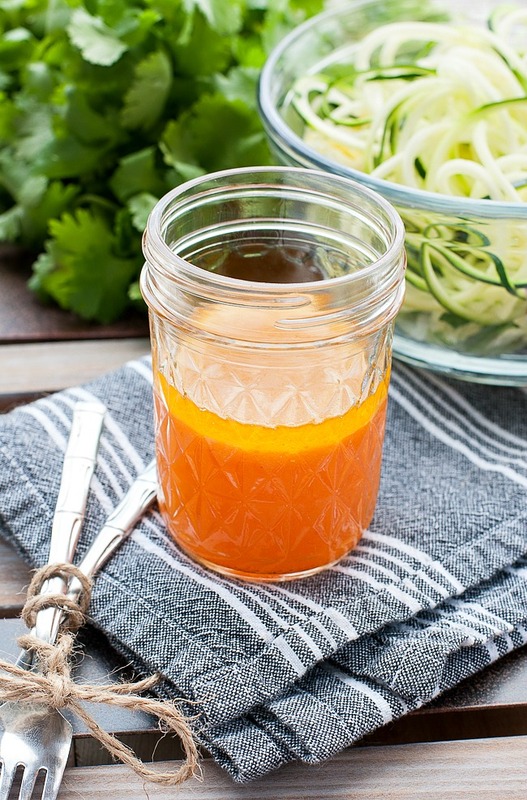 I love this sweet, spicy, citrusy dressing! It’s delicious!!! This is the best salad dressing EVER!! Even my husband, who hates salad, loves it! I love a little heat in my food. This salad dressing is one I am sure my family would love. Thanks for letting me use in my roundup of 26 Clean Eating Salad Dressings. Thanks for this recipe. I added about 1/2 tbsp of sesame oil and a tbsp each of chopped purple basil, cilantro and dill leaves and served it over a bok choi, shrimp and fresh vegetables salad. Loved it! Yum this sounds amazing I am going to drizzle it over everything! Sriracha is love!!! Yum!! This sounds incredible, and I’m salivating imagining it over a cucumber salad or shrimp dish. You can never go wrong with Sriracha and lime! This looks great! I think even mt salad hating husband would enjoy this! We totally need to get him on team salad now! 😉 Thanks Morgan! Oh wow. All of my favorites in one dressing. I can’t wait to try it! Thanks Kalee!!!! Hope you adore it as much as we do!